It is My Kitchen Rules Elimination Night and Jessica and Marcos have to score higher than 56 to stay in the competition. 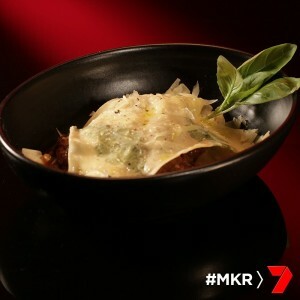 Who was eliminated from MKR tonight? Could it be Jessica and Marcos or Nev and Kel? 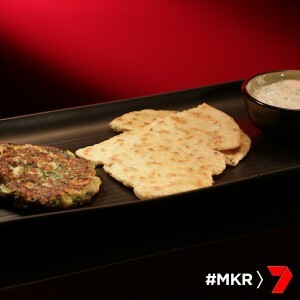 For entree they’re cooking herb and zucchini fritters with fennel flatbread and yoghurt sauce. For main they are making stained glass lasagne with mushroom ragu. For dessert they are making a spiced apple and pineapple cake with carrot and ginger jelly. The restaurant is called “The upper cut” and is based on a 1920s boxing theme. Jessica begins the spiced apple and pineapple cake. She decides that she has cooked this cake so many times that she’s just going to put the nutmeg in without measuring. They have made two separate cake batters and pop the cakes into two separate ovens. Marcos begins the mushroom ragu. Jessica says she doesn’t eat a lot of meat and that most people eat too much meat and that it’s not necessary for a healthy lifestyle. Jessica is bossing Marcos around a lot as she feels they are running behind on time. Jessica is checking on the two cakes. One cake is cooking well but the other cake is coking a little slower. The guests begin to arrive. Nev and Kel are worried about being eliminated tonight. Marcos takes the cake out of the oven and Jessica sees it and notices that it’s overcooked, it’s burnt. The other cake has cooked well. Jessica makes a start on the pasta dough. The guests are all expecting big things tonight as Jessica and Marcos have talked themselves up the entire time. Marcos and Jessica welcome their guests and head back into the kitchen to make their zucchini fritters. Marcos drains the grated zucchini and Jessica chops the herbs taking care to remove the stems. The judges arrive. It is an awkward and not overly friendly greeting. The judges say they are expecting fireworks tonight. The menu is revealed and the guests are shocked that the zucchini fritters are fried as Jessica doesn’t like oil. Marciano and Luciano are interested to see what the mushroom ragu looks like. Gareth and Alex are surprised that there is a lot of oil and a lot of carbs on the menu. Pete enters the kitchen and asks about the entree. Jessica says the fritters came from a dream she had. Pete asks how the flat bread works with the fritters, and how do they eat it. Jessica says she loves it but doesn’t really clearly explain how it is to be eaten. Marcos spoons out the zucchini fritters but Jessica wants them smaller. Jessica and Marcos start plating up their dish. They take it out to the judges. Pete and Manu taste the dish. First to comment was Pete. He said the star should be the herb and zucchini fritters, but it was “half way there, sort of”. He liked the colour and texture of the fritters but it was lacking flavour. The sauce was fantastic though. Manu said he was expecting something different, something healthy and full of flavour. The bread and the fritter didn’t really go together and the dish didn’t make sense as a whole. The other contestants aren’t really thrilled on the dish. They say it lacked salt and pepper and they couldn’t taste the zucchini. Marcos and Jessica get back into the kitchen to check on their mushroom ragu for the lasagna. They begin to roll out the pasta and put herbs through each sheet. It’s been an hour and 30 minutes since the entree and the guests are wondering what is happening in the kitchen. They cook the pasta sheets and make a test dish to taste. They are happy with what they have cooked. It’s now 2 hours since the entree came out. The guests are starving. Jessica and Marcos are still cooking the pasta in the kitchen. The finally start plating up the dish and take the dish out to the judges. Pete and Manu taste the dish. Pete says the presentation looks good and the pasta is not too thick and he is not worried about there being no meat. Manu says he is disappointed as all the mushrooms are just mush and it could be anything he was eating. Jessica interrupts him and says that’s the point, that it’s a trick, that it could be mince. Manu looks back at her confused about what she is saying, he has no idea how to respond to her strange comments. Manu says he is missing the salt in the dish. He says it’s not a bad dish. Pete says he likes it better than the entree but it was a bit spicy. The guests taste the dish. Nelly cannot taste any mushroom or cheese. Luciano and Martino cannot eat it, they are offended by it. They did say the pasta was nice and thin though. Marcos and Jessica get back into the kitchen get their dessert ready. Jessica cuts the top off the burnt cake. Jessica is whipping the cream, Marcos wants her to add all the sugar. Jessica only adds half of the sugar. The guests are still waiting, they’ve been waiting 1 hour and 45 minutes since the main. Jessica and Marcos are really taking their time. The guests are expecting perfection. They take the dish out to the judges. Pete and Manu taste the dish. Manu says it sounds like it is full of flavour on the menu but he is missing the spice on the cake, he cannot taste the pineapple and the cake is missing sugar. He doesn’t understand the dessert, he doesn’t like the jelly. Pete says it is his least favourite dish. He says it just isn’t sweet enough. Jessica says the cake is wholemeal, but Pete says whatever. Pete repeats again that the dish was just not sweet enough. The other contestants taste the dish. Nev likes the jelly and says the cake is moist. The other guests are not loving the dish. It is time for the contestants to score the meals tonight. 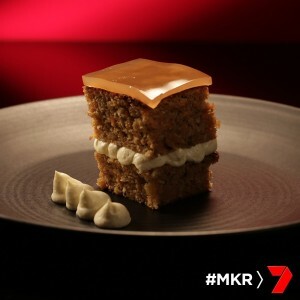 The scores will be revealed at MKR headquarters. One team is about to be eliminated. The judges have given a total score of 27. The grand total score of 38/110. This puts them in the last position. 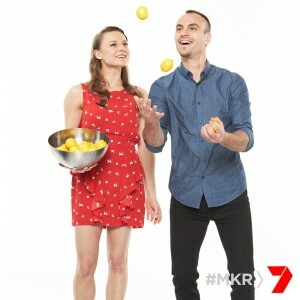 Jessica and Marcos have been eliminated from MKR. Com on, what did the guest teams score Jessica and Marcos? What were the individual team scores?